All copyrights belong to their original owners. These are not for profit fanfilm projects done on the internet. No money has been made from these projects, and they will never be distributed in stores or shown anywhere except the internet. 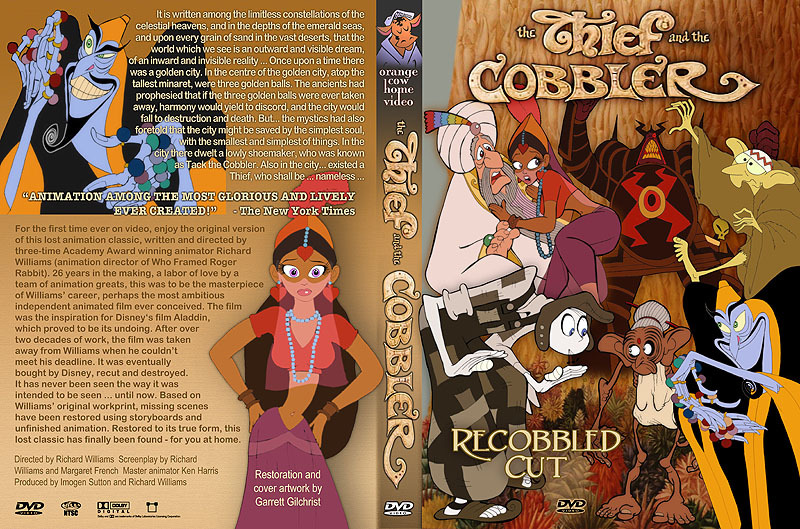 An unofficial, not for profit restoration - for the first time ever, enjoy the original version of this lost animation classic, written and directed by three-time Academy Award winning animator Richard Williams (animation director of Who Framed Roger Rabbit). Nearly 30 years in the making, a labor of love by a team of animation greats, this was to be the masterpiece of Williams career, perhaps the most ambitious independent animated film ever conceived. The film was the inspiration for Disney's film Aladdin, which proved to be its undoing. After over two decades of work, the film was taken away from Williams when he couldnt meet his deadline. It was eventually bought by Disney, in recut and destroyed form. It has never been seen the way it was intended to be seen ... until now. Based on Williams' original workprint, missing scenes have been restored using storyboards and unfinished animation. Restored to its true form, this lost classic has finally been found - for you at home. Watch it at Youtube and Google Video, and join the discussion at our message board. Not sold anywhere. It is available for free on the internet, so anyone can enjoy it. Have a look round for it online, to see where people are sharing it. This material is extremely rare, and has not been sold commercially elsewhere, so I've collected it here. The Story: It is written among the limitless constellations of the celestial heavens, and in the depths of the emerald seas, and upon every grain of sand in the vast deserts, that the world which we see is an outward and visible dream, of an inward and invisible reality ... Once upon a time there was a golden city. In the centre of the golden city, atop the tallest minaret, were three golden balls. The ancients had prophesied that if the three golden balls were ever taken away, harmony would yield to discord, and the city would fall to destruction and death. But... the mystics had also foretold that the city might be saved by the simplest soul with the smallest and simplest of things. In the city there dwelt a lowly shoemaker, who was known as Tack the Cobbler. Also in the city... existed a Thief, who shall be ... nameless.